Even given those big numbers, though, marketers know that sheer volume isn't where successful ads start. The real magic lies in the connection one ad makes with one consumer at a moment that counts. That's why the place where the brand meets the consumer is so important. When a publisher has a close relationship with users, it's like the ad is being introduced by a trusted friend. Today we'd like you to meet three publishers in the Google Display Network who help make those introductions happen: Men's Health, Apartment Therapy and Serious Eats. Their stories embody what we think is special about GDN: the way it balances those big reach numbers with relevance and trust. "One of the biggest advantages of working with Google is obviously the reach, and most importantly for us, the trusted reach, that Google brings to the table." In Men's Health, a story about diet and nutrition might be matched with an ad for a healthy oat cereal or a video of a celebrity chef offering low-cal recipes. That kind of match is made millions of times a month. These days those connections happen more and more on mobile screens. Men’s Health now has more than 125,000 subscribers on tablets, enabling them to bring, as Ronan explains, “a totally cross-platform, synergistic opportunity to advertisers to speak to our guys whenever and wherever they’re engaging with our content.” But on a personal device like a smartphone, the trusted reach that Ronan Gardiner talks about is all the more important. Apartment Therapy is "saving the world, one room at a time." Here you might see ads for handcrafted wood furniture matched to a photo essay titled "Organic Modern Dining Rooms." Maxwell Ryan, the founder and CEO of this über-cool home design collective, attributes his site's success to its ability to make an emotional connection with his readers: "We're addressing a very personal space for people in a very focused way." A personal connection with a very focused group: that's the kind of relevance that marketers really aim for. "Our audience is very passionate about food and they've come to trust us. So advertisers who advertise on SeriousEats develop that same credibility with our audience and their product." Founder Ed Levine says that "every post is the start of a conversation," and we believe you should be able to say the same for every ad. The Google Display Network portfolio includes 65% of comScore’s top 100 sites, so you can feel sure that your brand conversation will be happening on a site that has earned viewers' trust. That's our goal, after all: to make sure that your great ads get matched to the right audience on great sites like these. The Google Display Network makes those introductions, one match at a time, millions of times each day. We'll keep working hard to make sure the GDN continues to grow with full measures of reach, relevance and trust. To become part of the Google Display Network with your site, sign up today! Google Display Network offers a powerful blend of advanced targeting, innovative formats and best-in-class optimization tools that work across screens to help you reach and engage with your perfect audience. Today we’d like to take a closer look at our our reach and our partner sites that help you scale your message to precisely the right people – wherever they are. Display ads today need to captivate consumers with rich creative and dynamic messaging. But creating an engaging, beautiful ad takes time and effort. High quality ad creation – until now – has been a big challenge, putting it out of reach for small to medium businesses. Ready Creatives puts the power back in your hands – and makes it easier than ever before to create beautiful ads that can be consistently displayed across screens. With one single click, take advantage of Ready Image Ads flexibility by simply adding your website URL to automatically construct display ads based on images from your website. You can customize further by adjusting the text, font, color, images, headlines, URL and more – in a way that best tells your story. Our friendly user-interface and streamlined process enables you to build display ads in minutes, automatically creating IAB standard ads in HTML5 formats using your existing elements from your website or your own uploaded images. And these HTML5 ads can be viewed across mobile devices as well as desktops! Ready Creatives doesn’t just quickly cobble together the elements you want included in your ad – it helps you build campaigns that engage customers with stories they love, remember and share. Our Ready Ad Gallery features pre-built templates you can easily customize based on your campaigns goals. Dynamic Ads – Dynamic Ads deliver tailored creative across the web that combine the layouts, products, messages and offers that your customers are most likely interested in, based on what they viewed on your website. Engagement Ads – Engagement Ads captivate consumers with rich creative messages. They fit in standard display units, allowing to scale across the web, and then expand to a larger format after an innovative two-second hover delay. Video Ads – Videos are as effective as TV in building awareness of your business. Create a quick video ad in seconds that showcases your brand. General Purpose Ads – if you need a simple display ad, browse through our hundreds of template options and customize in our easy-to-use editing tool. Building display ads has never been simpler, and we’re making this capability accessible to all advertisers at no additional cost, and as part of the AdWords campaign workflow. No matter what type of ad you choose, you can be sure you will not only have saved time and money but also have created an ad your customers and prospects are sure to love. To get started using Ready Creatives today, log into your Adwords account and click on the Ads tab. For more information, visit www.google.com/think/products/ready-creatives.html. Building on VP of Product Management Neal Mohan’s presentation to the Mobile Marketing Association about building cross-screen creative in HTML5, and Product Management Director Brad Bender’s keynote speech about advances in creative formats at IAB MIXX yesterday, we’re excited to announce the launch of Ready Creatives – our groundbreaking new solution to make display ad creation easier than ever. Ready Creatives consists of two powerful tools: Ready Image Ads and Ready Ad Gallery. Working with Ipsos Research, we surveyed 3,000 mobile searchers who had recently made purchases across different industries to understand the role that click to call - from paid or organic search results - played in the purchase process. We found that calls are not only an important channel for research and transaction, but also the presence of a phone number in search results can strongly influence the perception of a business’s brand. We broke down the purchase process into its component phases - Inspiration, Research, Purchase, and Post Purchase Experience – to see when consumers are most likely to call a business. We found that calling is most important during the research and purchase phases, where 52% and 61% of mobile searchers respectively say it’s important to have the ability to call. This means that a large number of calls happen when someone is ready to buy or helps a consumer move closer in purchase consideration. 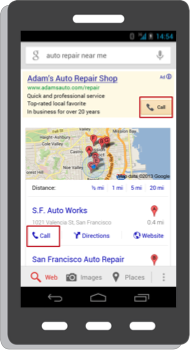 Adding click to call can also boost the effectiveness of your ad, whether it's because users feel more confident in your business or because of the larger ad size due to the call button. On average, AdWords advertisers that implement click to call see an increase of 8% in the click through rates of their ads. To explore more of the findings from our calls research visit the Think with Google site or click here to learn how to get started with call extensions now. Capture more high-consideration conversions. Many advertisers sell products that customers want to research thoroughly before making a purchase -- for example, a new insurance policy or an expensive laptop. Sometimes, conversions for these products may take longer than 30 days to occur. You can now ensure you measure more of these conversions and get a more complete picture of the value of your advertising. Measure longer term value of your customers. Some businesses have a goal to drive repeat purchases from recent customers. For these businesses, extending the conversion window means you can now measure more of these repeat purchases and gain insight into the longer term value your advertising drives. Discover more upper funnel keywords. By increasing the length of the conversion window, you can discover keywords that play a role much earlier in the conversion funnel, especially if the shopping cycle is long for your customers. When you click to edit your conversion window, you'll see a link to the Search Funnels time lag report. When you view this report, you’ll see the average and a distribution of the length of time it takes your customers to complete a conversion after clicking on keywords in your account. You can use this to help you decide how long of a window to set. For more information on how to customize your conversion window, check out this help center article. A consumer’s journey to purchase isn’t always immediate. People may search on a number of keywords, over several days and across different channels before making a purchase. Sometimes decisions span a few days, but more significant decisions, like buying a car or booking vacation travel, can take longer. To help you have a more complete and accurate view of your customers' path to purchase as you optimize and evaluate your ROI, we recently launched cross-account conversion tracking and the ability to import conversions in AdWords. Today, we're also adding the capability to customize your conversion counting window from 7 to 90 days after a click. Previously, AdWords only counted conversions occurring within 30 days after a click. Potential buyers have increasingly turned to the web as the first step in their purchase decisions. So for years, digital marketers in insurance, auto sales, and other high consideration industries have been using AdWords to build awareness and generate leads. These leads have been handed to sales reps, who then help customers complete the purchase process. In AdWords, you’ve been able to see which keywords lead to higher or lower lead volumes, and to optimize for a cost per lead goal. But there's been no easy way to measure and optimize in AdWords for events that happen beyond the website, like a customer order taken over the phone by your sales team. 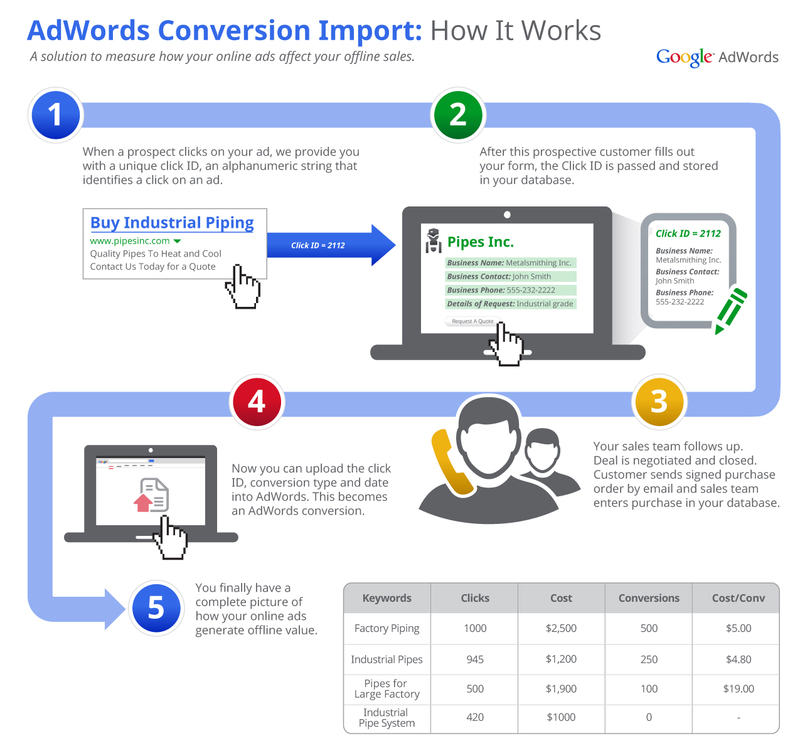 The new AdWords conversion import feature can help you measure and optimize for the complete end-to-end purchase process. Now you can upload your offline conversion events into AdWords and see how clicks on your ads led to sales made in the offline world such as over the phone or via a sales rep.
And since your offline conversion events will be incorporated into your existing AdWords conversion data, tools such as Search Funnels, Automated rules and Flexible bid strategies can leverage that data. Let’s see how importing conversions can help a small business measure and optimize for the entire customer journey, from online leads to offline sales. Isabelle designs, builds and sells high-end custom furniture. She uses AdWords to drive prospective customers to her website, where they can submit their contact information and request a sales call. AdWords Conversion Tracking can measure these raw lead submissions, but since most of them won’t result in a sale, she optimizes her campaigns on raw submitted leads; not actual sales. Now that she’s able to import her offline conversion data (including sale value), Isabelle can better understand which keywords drive the most profitable sales. With a more accurate ROI picture, Isabelle can better manage her bids and budget. For step by step directions to get started, check out this article on how to import your offline conversions. Several software solution providers, including Marketo, Mongoose Metrics and SugarCRM have also posted guides on integrating with this new feature. In addition, we have published a guide for integrating with Salesforce.com’s Sales Cloud. As we mentioned last week, with the launch of cross-account conversion tracking and Search Funnels, we’re working on tools like the conversion import feature to help you measure your customer’s complex path to purchase. Our product roadmap has lots of improvements and new features aimed at providing a more complete picture of your customers' journey and more accurate measure of ads effectiveness across devices and across channels. Stay tuned! Every event is led by Google product experts and includes a live Q&A. Looking to broaden your knowledge base to make the web work for you? Learn with Google just added new webinars to our schedule this month, so be sure to register and join us. These upcoming September webinars focus on display advertising for several different experience levels.
. Questions on the event pages below will also answered in the Q&A. How do I include the right price into my data feed? How does tax & shipping work? What if I have a sale or promotion for free shipping? What do I do if my feed is disapproved? What are the common data feed and data quality pitfalls? How do I ensure all my products are approved? What are the best practices for updating and editing my feed? What are the various data feed upload methods? How do I improve my data quality? With less than three months to Black Friday, the holiday shopping season is quickly approaching. We know that advertisers with Product Listing Ads campaigns are in search of new ways to optimize their product data and drive more traffic to their stores. Last week, we hosted Google Shopping Office Hours via Hangouts on Air to share general advice on data feeds and unique product identifiers. We saw great engagement and will be broadcasting additional sessions, deep-diving into topics that will help prepare your data feeds for the holidays. Below is a calendar of Google Shopping Office Hours for the upcoming months. We encourage you to attend sessions of interest. We’ll discuss the topic for the first 20 minutes then open up the forum to live Q&A. If you already know what you’d like to ask or want to request a topic, feel free to submit your responses here. Questions on the event pages below will also answered in the Q&A.